What was before – What once occupied the site of today’s Pru? Seen from any approach to Boston, the Prudential Tower has figured prominently into Boston’s skyline since its construction in the early 1960’s. And, with 52 floors, the Pru stands as Boston’s second-tallest building, just behind the John Hancock Tower‘s sixty. The Tower, completed in 1964, rises 749 feet, or, with its radio mast (pictured atop the building), 907 feet, making it the 77th tallest building in the United States. The Pru contains some 1.2 million square feet of retail and commercial space, the highest observation deck in New England (that is currently open to the public), and a restaurant on its 52nd floor, Top of the Hub. Announced in 1957, the plans for the new Prudential Center were seen as ‘a rebirth’ for a section of Boston that had been considered dated and in need of renovation. 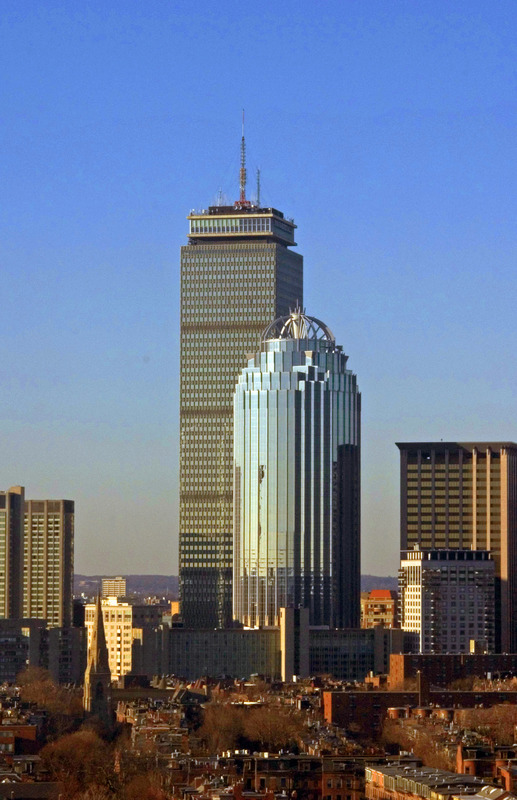 Mayor Hynes announced that the construction, led by Prudential Insurance, proved that “the city of Boston [was] about to be reborn.” At the time, the new skyscraper promised to be the tallest in Boston, dwarfing the nearby John Hancock Mutual Life building, built by its rival and standing 26 stories. (Hancock eventually got its revenge several years later when it constructed the slightly taller Hancock tower.) Prudential planned to build a structure standing 45-50 stories for its new regional home office, citing that the construction as a good long-term investment in Boston. The Prudential Tower is just one of twelve buildings that were planned to be built as part of the Prudential Center, which occupies 31 acres on a site bordered by Exeter Street on the east, Dalton Street on the west, Boylston Street on the north, Belvidere Street on the southwest, and Huntington Avenue on the southeast. But, what stood on the site of the Prudential Center before its construction? Twenty-eight acres came from land belonging to the Boston & Albany Railroad and used as a freight yard. Another half-acre came from the Mother Church, First Church of Christ, Scientist. The remaining two-and-a-half acres came from Mechanics Hall, described in 1957 with such words as “grim” and “dated”. The Massachusetts Charitable Mechanics’ Association built Mechanics Hall on Huntington Avenue in 1881. During the Victorian era, it was one of the city’s largest halls with a seating capacity of 8,000 people and housed many of the day’s exhibitions and fairs. Even by 1881, the Massachusetts Charitable Mechanics’ Association had deep roots in Boston, dating to the association’s founding in 1795. The Association’s annual income went to providing relief to mechanics and their families who had fallen upon hard times. Any funds left were used for loans to young mechanics and to establish schools and libraries to support the profession and further the education of apprentices. Mechanics Hall covered an area of over 110,000 square feet. Its frontage on Huntington Avenue was 600 feet; on West Newton Street, 300 feet. Its tower, 90 feet in height and 40 feet in diameter, formed the eastern end of the structure. The Hall’s two entrances, one from the sidewalk on Huntington Avenue and another from the carriage porch, were made from a combination of brick and stone. Following the Hall westerly along Huntington Avenue, the next section after the tower was the administration building and then the exhibition hall, which boasted spacious galleries and a large basement. Past the exhibition hall was the grand hall, which formed the west end of the building. 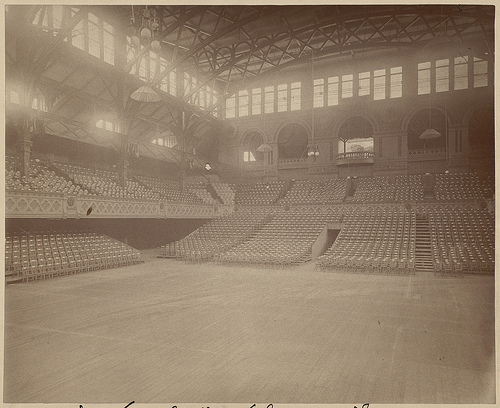 It was the grand hall that sat some 8,000 people, and which held the Hall’s famous Roosevelt organ. The administration building had, on its first floor, offices. Small dining rooms filled the second floor. The third floor contained another large, ornate hall. Within Mechanics Hall, exhibitions frequently showcased the latest innovations in the field of science and mechanics. During its 19th-century heyday, visitors to the hall saw a strength-testing machine, railway electric safety signals, and a postal stamp cancellation machine. The destruction of Mechanics Hall in 1958 and the subsequent construction of the Prudential Center were seen as supporting the urban renewal embraced by many mid-century Bostonians. This same urban renewal scheme brought Boston such ‘modern’ architecture as Government Center and left a lasting mark on the city’s historic West End. Today, the Prudential Center is a vibrant commercial and retail hub, frequented by many residents and visitors to the city. Still, there’s a certain sense of loss that one considers when viewing photographs of Mechanics Hall, which once stood on the site, when Huntington Avenue was a much quieter place. Now the 77th-tallest building in the US — when it was completed, it was the second-tallest (maybe tied?) building in the world outside Manhattan. Hey there Ryan. Thanks for some interesting information. Fun fact: my grandmother worked in the Prudential Building as a secretary from the time it went up until her death in 1970. I have a Boston question I have concerning another relative, my grandmother’s sister, who worked as a telephone operator at New England Telephone & Telegraph from around 1920 to around 1935. I’m finding lots of information and photos about the company’s art deco building built in 1947, but do you have any idea where NET&T was in the 1920s? I’m researching for a book and I have yet to find any information on this.